Resplendent in ethnic style, this backpack displays Peru's textile legacy. 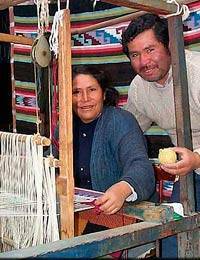 Faustino Maldonado and Family weave the bag of acrylic and alpaca blend yarns in a colorful symphony of brown hues and lead blue. The flap and external pocket are lined with cotton, and the bag features a practical drawstring closure. Two mate gourd buttons engraved make for the perfect finishing touches.